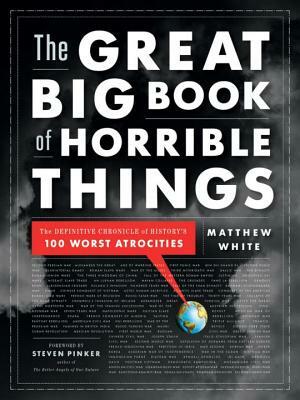 The Great Big Book of Horrible Things: The Definitive Chronicle of History's 100 Worst Atrocities (Hardcover) | Fountain Bookstore, Inc.
Evangelists of human progress meet their opposite in Matthew White's epic examination of history's one hundred most violent events, or, in White's piquant phrasing, "the numbers that people want to argue about." Reaching back to 480 BCE's second Persian War, White moves chronologically through history to this century's war in the Congo and devotes chapters to each event, where he surrounds hard facts (time and place) and succinct takeaways (who usually gets the blame?) with lively military, social, and political histories. With the eye of a seasoned statistician, White assigns each entry a ranking based on body count, and in doing so he gives voice to the suffering of ordinary people that, inexorably, has defined every historical epoch. By turns droll, insightful, matter-of-fact, and ultimately sympathetic to those who died, The Great Big Book of Horrible Things gives readers a chance to reach their own conclusions while offering a stark reminder of the darkness of the human heart.